They call this antagonist "The Shimmer" due to its oil spill effect on the area it inhabits, creating a wall of pulsing iridescence. Though this would seem harmless enough, whoever goes inside never comes back. Natalie Portman is Lena, an Army veteran with a heavy past who’s currently teaching biology at Johns Hopkins. She’s in mourning for her military husband, who’s been declared KIA for the past year. It’s no surprise that when offered the chance to inspect the site of his last known whereabouts (The Shimmer), Lena would accept. Joining Lena is a team of all women, purposely chosen due to the former disappearances of any all-male military groups. There’s the psychologist, Dr. Ventress (played by Jennifer Jason Leigh) whose infatuation with the “why” behind The Shimmer has dire consequences. Then we have the physicist Josie (“Thor: Ragnarok’s” wicked Tessa Thompson) along with medic Anya and scientist Cass Sheppard. Their journey into The Shimmer is not without its physical struggles, but the biggest battles are the ones within. They result in revelations and repercussions that are far from understood. 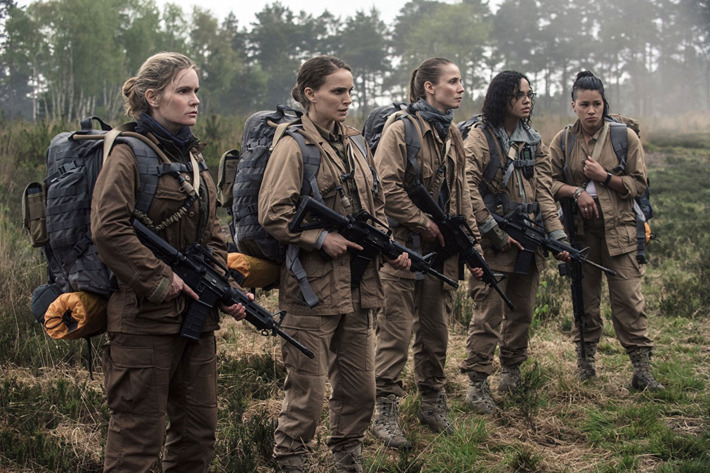 "Annihilation," which would've been a cast of all males a decade ago, is helmed by powerful female performances. None are portrayed as the damsel or the evil villainess, but as complex and layered humans who are all affected separately by The Shimmer. Natalie Portman tackles the role with curiosity and depth— she is observant and persistent as Lena. “Annihilation” is similar to 2013’s sci-fi epic “Interstellar” in that the overall idea requires shedding normal human vanity for the bigger picture— life itself. The Shimmer is doing the same that any life form is trying to do: survive. The refraction and reflections that occur in this place represent an eternal story far greater than the one our Earthly history provides. It’s an eclectic take on humanity that is at once terrifying and refreshing. The world building that occurs throughout this film is rich and flavorful; based off of Jeff Vandermeer's 2014 novel, this film adaptation has an encyclopedia of science-fiction story-telling development at its fingertips, and Alex Garland uses this knowledge to his absolute advantage. The spookiest aspect of "Annihilation" isn't that The Shimmer exists; it's that The Shimmer hasn't just changed the environment, it's enhanced it. Watching this film is downright eerie, as the women trek through an average forest covered in iridescence and beautiful mutations. Alex Garland has done something truly ingenious in that he’s provided us with a cathartic sci-fi thriller, slow in pace but quick in idealism. It answers all your questions while still leaving you shell-shocked. In fact, most of your questions are answered in the first five minutes of the film. Garland didn’t want you questioning every little plot detail; he wanted you to focus on the bigger picture— one where the answers are, quite literally, reflected in front of you. “Annihilation” enraptures and intrigues its audience, but it’s not for the faint of heart. This isn’t due to vulgarity or the macabre, rather, it’s hard to digest due to its paradoxical nature. While not by any means an “action” film, you will feel more engaged watching the mental landscapes adjust in “Annihilation” than waiting your turn to jump out of an airplane. 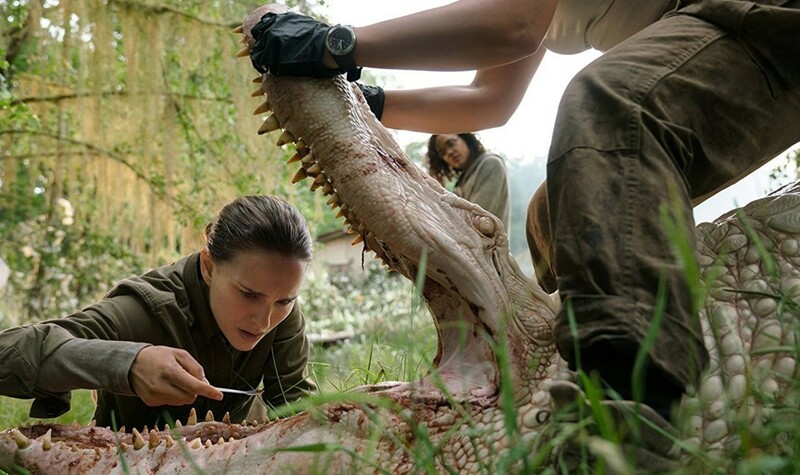 Ultimately, whether Alex Garland's “Annihilation” enhances or reduces its reflections is up to you. Regardless, it's cinema that deserves to be seen. "Annihilation" is in theaters everywhere.